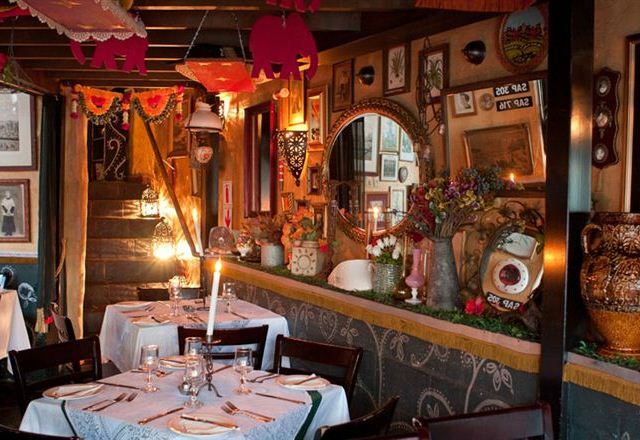 Cape Town has a lot of great dining options, and we wanted to try something off the beaten path. 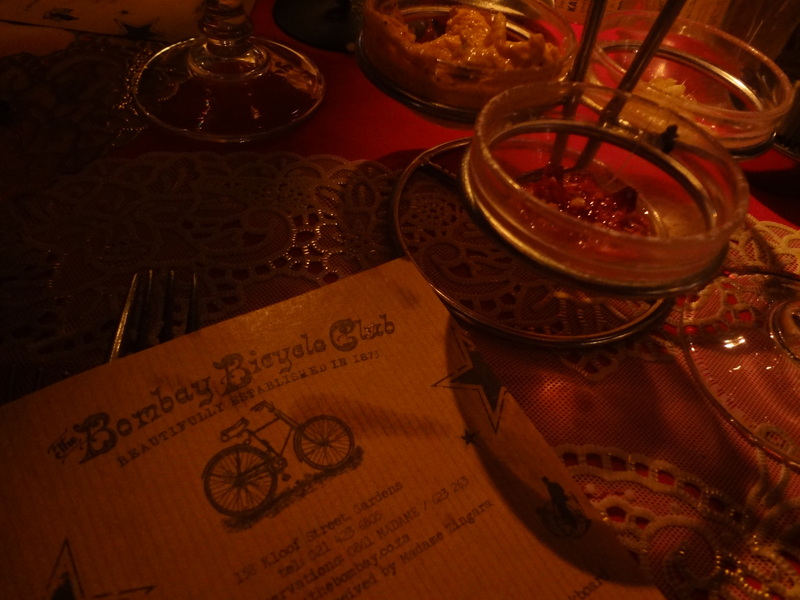 Enter, the Bombay Bicycle Club. Admittedly, we were under the mistaken assumption that this would be an Indian restaurant. While Tandoori Chicken is on the menu, it was less Bollywood and more British colonial era. But an amazing dining experience nonetheless! 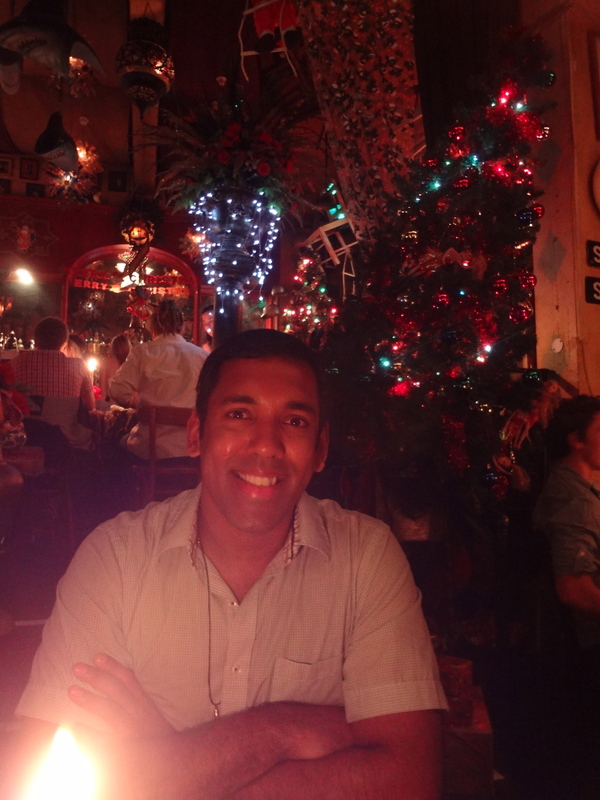 For starters, the ambience is festive to the extreme. There is a bed hanging from the ceiling, a topsy-turvy Christmas trees festooned with tinsel by the bar, and a hodgepodge of antiques on the walls. Imagine if the Mad Hatter and Dame Edna threw a holiday party at Grey Gardens, and you’ve got the eclectic decor of the Bombay Bicycle Club. The music is equally amazing! 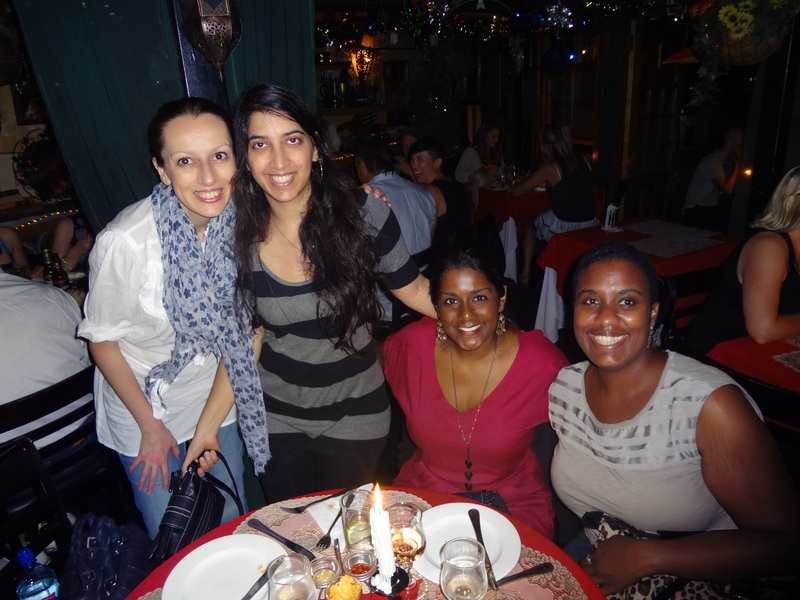 We dined with Sunil’s friend Janis, who is a smarty pants Fulbright Scholar based in Durban, and her friend Isabel. It was really interesting to hear Janis’ take on day-to-day life in South Africa, as an American woman of color. And the food? Delicious! Everyone at our table raved about their entrees. 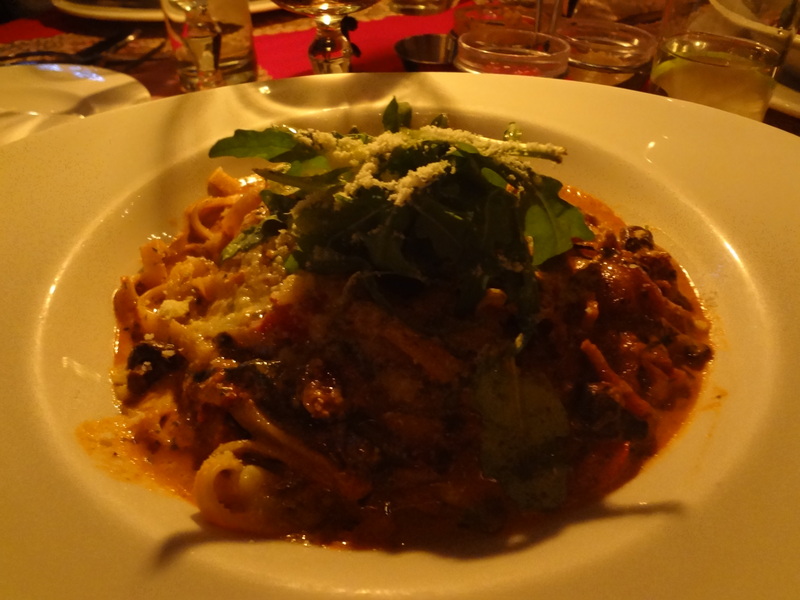 I had the Fettuccine Fantasia: “bacon, mushroom, tomato & chilli, served with fresh fettuccine, cream & parmesan.” I still dream about that pasta! 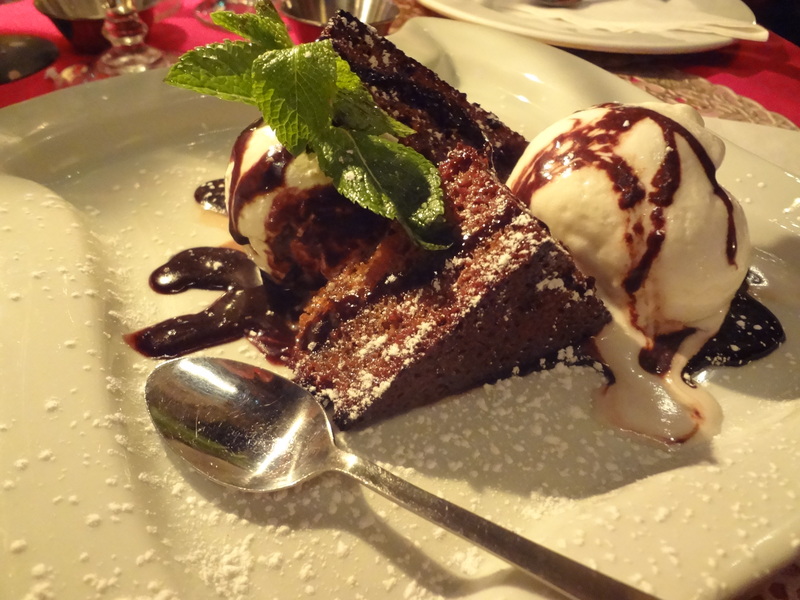 For dessert, we shared the Malva Pudding, a traditional South African dish. A fab night in Cape Town! You used the word “festooned”! Ha! So jealous of your adventures!!! Miss you! haha I definitely had a laugh when I used that word, and thought of you guys! Trying to increase usage of it in day to day speech 😉 Miss you too!